Spicy chilli chicken, my husband always loved this curry in-fact I can say he is totally crazy about chilli chicken. I made it many times for him but never posted in my blog. 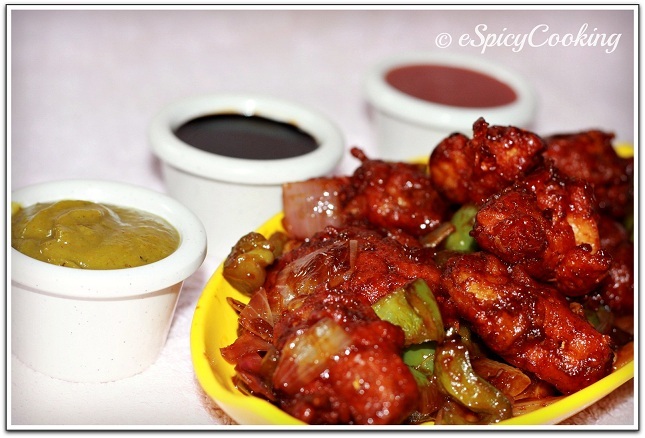 Today I thought to write a post on how to make chilli chicken at home. If you are already making it at your home then its good, if not then try my style today and let me know how it goes. In a kadai add enough oil for frying those chickens. Once oil becomes hot add those chicken pieces and fry them till golden brown. Now in another pan add 2tbsp oil, once oil becomes hot add chopped garlic and fry for few seconds. 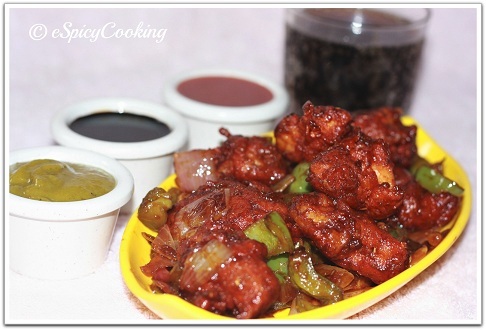 Add onion and capsicum to it and fry it 1-2 minutes. Do not fry those onion and capsicum too much. Add rest of soya, tomato, chilli sauce, ajinomoto, salt to it and mix well. Add those fried chicken to it and give it a quick mix. If you want little gravy then mix a tsp of corn flour to half cup of water and add it with chicken. Let it sit in a low flame for a minute. 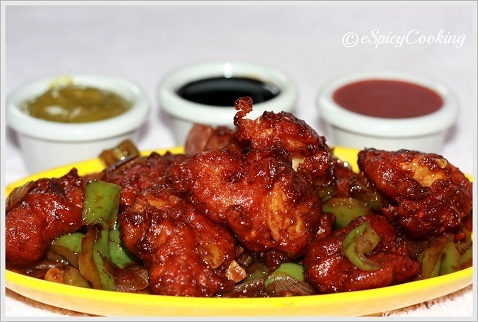 Now your delicious chilli chicken is ready to serve with rice, roti or paratha. I love to have it with paratha. Thanks for the recipe, I cooked this yesterday and it turned out so well. We all enjoyed the food here and a Big thanks from all of us..
Hi Priya, I am glad that it came out well and you all liked it. The recipe is just awesome. thanks for upload. just let me know what should one do for tangy chicken. should we add vinegar! Hi Priya, yes you can add vinegar before marination and you can do one more thing, at the time of adding sauces to the chicken add little more water to it so that you can get more soft and tangy chilli chicken. It was really awesome enjoyed a lot. Do we add the paste / the chicken & then fry? Yes add paste which i mentioned above to the chicken then fry.